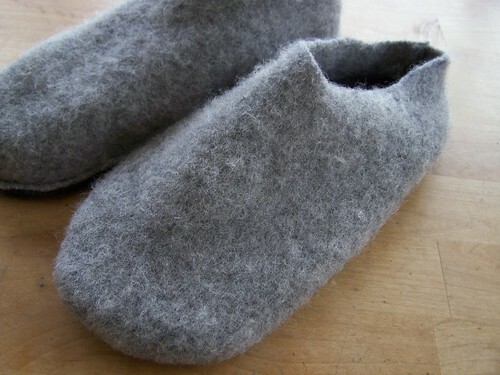 Slipper clogs made from felted sweaters...as opposed to the Felted Slipper Clogs I usually make. 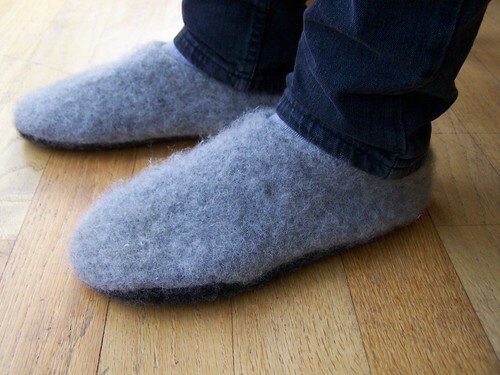 I've been making the Fibre Trends Felted Slipper Clogs for quite a few years now and they are always well-received as gifts (we all LOVE them). My parents each have two pairs and have brought them back to me a few times now so that I could put new bottoms on (from felted sweaters) since they wear them so much that they wear holes in them (yes I do accuse them of being "shufflers" and give them a hard time). 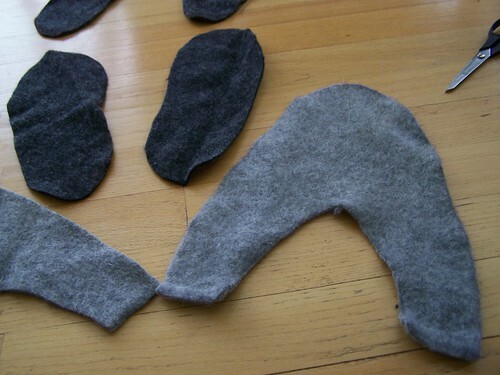 When I was repairing them yet again last month and thinking that perhaps they each needed a new pair, I thought that I should just find a way to make them - the whole slipper - out of felted sweaters, because that would be so much quicker and easier for me than knitting a whole new pair. So...I thought I would use my Dad's upcoming birthday as a chance to try it out. I made a pattern of what I thought the top should look like then traced the bottom of one of W's slippers to use as the slipper sole. I cut one top for each slipper and two bottoms each (since that is the part they always wear through I wanted to make it double thickness). Sewed them altogether then just slightly turned the ankle edge under (to the wrong side) to finish it off. Then, even though I had already felted the sweaters before cutting, I threw them in the washer for a bit more felting to sort of tighten them up and finish them off. I lived in the Arctic and the Inuit women make "alaarktik"...essentially what you've made here, but with with a tall boot-leg. They buy their rubber boots a size too big so these liners will fit inside! 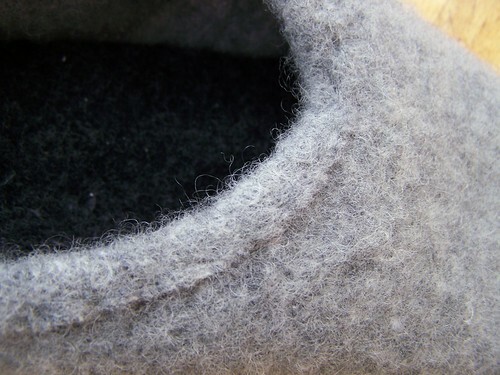 The sole is sheepskin and the rest is thick wool felt, with all kinds of embroidery. I learned to make them and still have all the patterns to make every size imaginable. I made slippers for my whole family the year I was up north, and my dad wore his first pair right out. Thanks for reminding me of them. Yours are lovely. Fabulous!! I've been wanting to try my hand at making some as well, and it is so encouraging to see how beautifully yours turned out. And that it took only an hour! 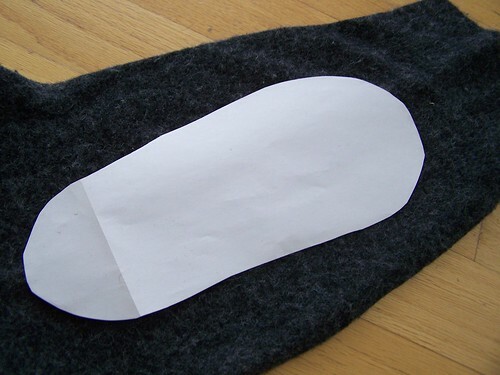 I have been making slippers from old sweaters for a couple years now and was getting so frustrated that the bottoms would wear out, maybe my family needs to pick up their feet? ;) I finally found a pair of suede pants at the thrift store and took apart my current slippers and made a bottom out of that. So much better plus they are not as slippery on my wood floors. I am hoping that this makes the bottoms last a bit longer then just the wool. I love your pattern, looks so much easier then the one I have been using. Love your blog too. Cozy and cute! Love these slippers, Heather! Next time I'm in the thrift store I'll be looking for wool sweaters to felt and make some..mine are looking pretty shabby these days. Thanks for the inspiration! FANTASTIC! love them! highly recommend the suede bottoms though! all wool wears out when rubbed against hard floors. These turned out so well. These turned out so well, Heather! Though I've been knitting for seven years, I have yet to experiment with felting. This project seems perfect, though (and I know lots of people with cold feet). Well done, Heather! Definitely faster than knitting a pair... did you use a whole sweater to make one pair? I'm adding leather to the bottom of the clogs I just made in hopes of making them laster longer. You know how much I love wearing slippers! I'm sure your Dad will appreciate these handsome replacements. They turned out great! What a good use for old wool sweaters:-) I'm sure your dad will love them! 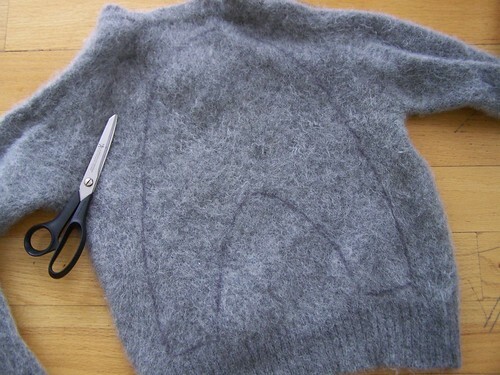 Great idea....I have a sweater that was accidently "washed" ~ it shrank and felted...I haven't been able to wear it, but couldn't bear to get rid of it. Good thing I didn't! It will be the perfect thing to try this with. Brilliant! I'll bet your dad just loves 'em! thank you so much for sharing this! 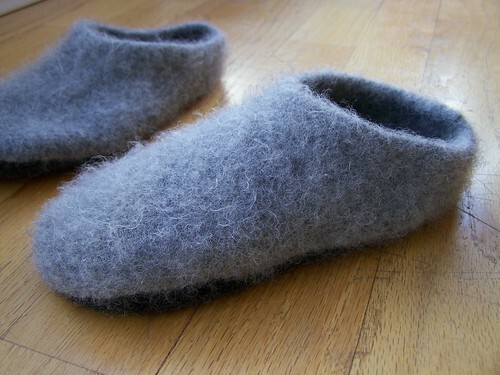 i have a pile of thrift store sweaters that i have felted and i plan to make slippers for my family this christmas. thank you! Do you have dimensions or a pdf pattern for the top of the slipper? You have quite a wide angle for the top of the slipper. Guess I could make a paper pattern for the top and give it a whirl. Is that booerang-shaped piece the entire top of the slipper??? ?